The development of bilateral relations in various areas was high on the agenda of talks held between President Ilham Aliyev, who was on an official visit to the United Arab Emirates, and Vice President and Prime Minister of the UAE, Emir of Dubai Sheikh Mohammed bin Rashid Al Maktoum. The two officials met in an expanded meeting in Dubai on February 2. The sides stressed the successful visit of Sheikh Mohammed bin Rashid Al Maktoum to Azerbaijan. Sheikh Mohammed bin Rashid Al Maktoum said he was deeply impressed by development processes in Azerbaijan. “You have a beautiful country, beautiful people. I witnessed this during my visit to Azerbaijan,” he noted adding that the first European Games were excellently organized in the country. 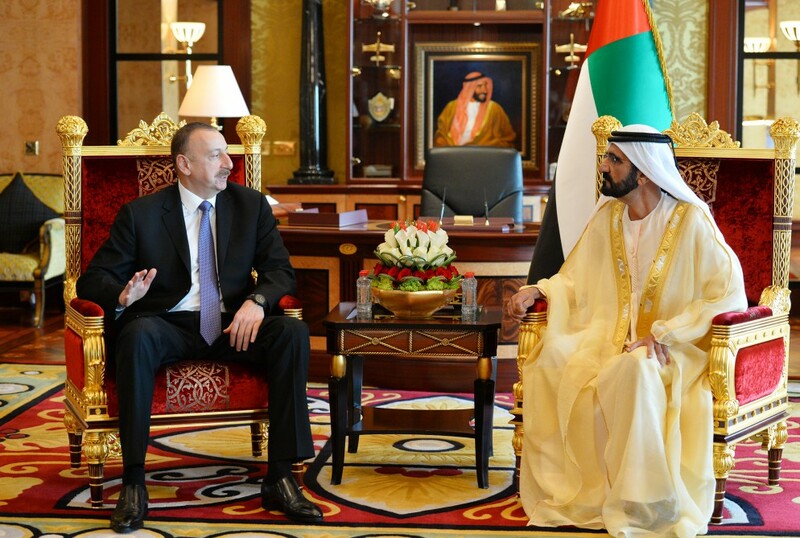 President Aliyev thanked Sheikh Mohammed bin Rashid Al Maktoum for warm words and said Azerbaijan has become a venue for international events, expressing his confidence that the Islamic Solidarity Games to be held in the country next year will contribute to international cooperation. President Aliyev also congratulated Sheikh Mohammed bin Rashid Al Maktoum on the economic development of the UAE, including Dubai, saying he witnessed the country's outstanding success during his current visit. Sheikh Mohammed bin Rashid Al Maktoum touched upon the global economic crisis and sharp decline in oil price, highlighting what the UAE was doing in this regard. President Aliyev said Azerbaijan is also carrying out large-scale measures related to global processes. In particular, substantial work is being done in the country to define a new economic model, the president said adding that it will cover a broad range of economic areas. President Aliyev also hailed the activity of the Joint Economic Commission, saying it contributed to the expansion of the bilateral cooperation, including in the field of investment making. The head of state said there are good opportunities for developing the cooperation in the field of tourism as well, and added that the development of tourism is a key priority for Azerbaijan. The construction of high-class airports and the establishment of tourism infrastructure in regions contributed to the growth of tourism flow, President Aliyev said. Sheikh Mohammed bin Rashid Al Maktoum hailed high quality of Azerbaijan-made agricultural products, stressing the importance of increasing fruit and vegetable exports from Azerbaijan to the UAE. President Aliyev also said there are good opportunities for the UAE companies to participate in infrastructure and water supply projects in Azerbaijan, as well as in the ongoing construction of a sea port, establishment of a free economic zone, and investment making projects in the country. The sides noted that friendly ties between the people of Azerbaijan and the UAE contribute to the development of the bilateral relations. Prospects for expanding the cooperation in the fields of production, industry, logistics and air transportation were discussed during the meeting as well. Later, President Aliyev and Vice President and Sheikh Mohammed bin Rashid Al Maktoum participated at the signing of documents between Azerbaijan and the UAE. Azerbaijan's Economy and Industry Minister Shahin Mustafayev and Minister of State for Cabinet Affairs of the Federal Government of the UAE Mohammad Abdulla Al Gergawi signed an agreement on institutional cooperation on sea transportation and a Memorandum of Understanding on cooperation in the field of information and communication technologies. Azerbaijan and UAE enjoy fruitful cooperation in various fields and their mutual relations are developing both in the political, economic and cultural fields with ascending line. The diplomatic relations between the two countries were established in 1992. The Azerbaijan State Customs Committee statistics show that in January-September 2015 the trade turnover between the two countries amounted to $46.78 million, $42.2 million of which fell on import to Azerbaijan.